Launch of Tell Them It Was Mozart (Brick Books). Through public judgments, detouring dreams and unspoken prayers Angeline Schellenberg’s debut collection traces both a slow bonding and the emergence of a defiant humour. This is a book that keens and cherishes, a work full of the earthiness and transcendence of mother-love. One of the pleasures of this collection is its playful range of forms: there are erasure poems, prose poems, lists, found poems, laments, odes, monologues and dialogues in the voices of the children, even an oulipo that deconstructs the DSM definition of autism. From a newborn “glossed and quivering” to a child conquering the fear of strange toilets, Tell Them It Was Mozart is bracing in its honesty, healing in its jubilance. 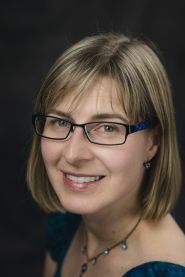 Angeline Schellenberg’s poetry has appeared in Prairie Fire, CV2, TNQ, Rhubarb, Room, Geez, Wordgathering, Lemon Hound, and The Society, as well as in anthologies. Her first chapbook, Roads of Stone, was released in May 2015. Her poetry won third prize in the 2014 Banff Centre Bliss Carman Poetry Award Contest and was shortlisted for Arc Poetry Magazine’s 2015 Poem of the Year. Angeline lives in Winnipeg with her husband, their two teenagers, and a German shepherd/corgi.